You really need a bigger tank 😁. Ok, i have got a important question, should i move the rock against the back to create some space for more coral or is the flow behind it to important? Bonus catalaphyllia pic, this thing is beautiful! Sorry for your loss Surveyman. It's always sad if you lose a fish and you can't find out why. The ai prime is a good option with lots of controle. Have you thought about a nanobox tide? Imho best option available for the fusion 10. Keep in mind, that powerhead isn't going to make life easy for the mollies. Good luck Kimber! Thx @ninjamyst, i really love your tanks. The evo 12 is a real treasure. Thx @Christopher Marks, besides weekly 50 to 70% water changes with natural seawater i only feed my corals 1/5 a teaspoon reef roids a week. I don’t spotfeed it i just mix it up with tankwater, shut down the return pump and pour it in front of the mp10. Also I often see my acan, rics and duncan catch a pellet or flake and eat it. Little picture update... Had to move my duncan frag to the sandbed because the mitrax decided the little hole in the rock that was perfect for the duncan fragplug is his home 🙄. Why is my frogspawn always this puffy? Any answers? Thx man! 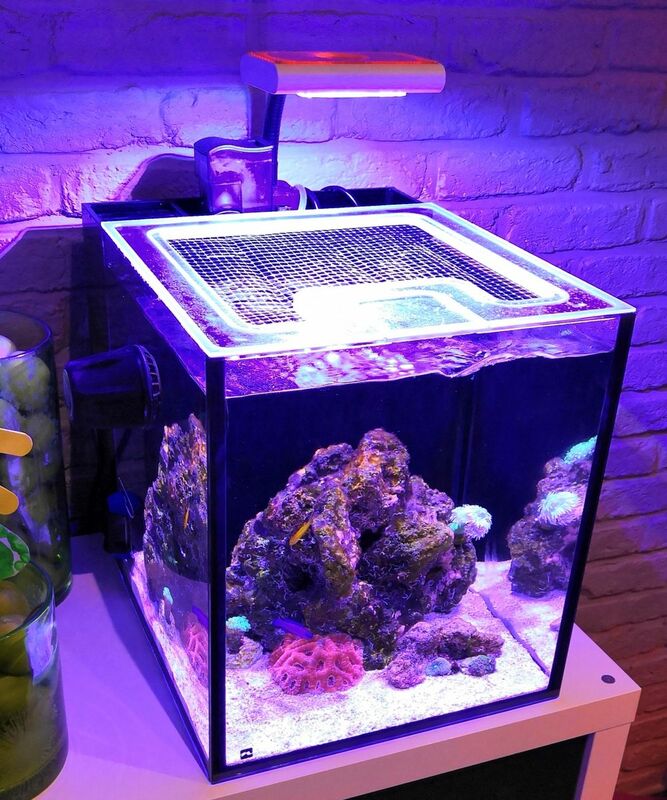 Finally, you are doing something with that awesome sump. Good to see you back Thomas! Thanks @vlangel, this is really good advice!. That's the reason why i'm doubting about the waterbox cube 20. It's not much bigger and i can keep the same maintenance schedule. I would use a tunze 9001 skimmer because now my skimmer is really inconsistent and i tend to feed a little heavy. My aquascape is just one piece of rock and it's just a little bit to big. I can't get past it with my tunze nano care magnet. The fridmani is really eating like a pig (love that fish) and almost doubled in size in just 3 months. 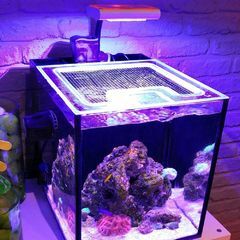 If i sell my bb king, red dragon and skimz sump i could use the money to buy the waterbox cube 20, skimmer, intank media baskets and new acrylic top. I actually don't want more fish. I would like my tank to have my duncan and one or two large hammers, frogspawn or torch corals as the showpieces complemented with some zoa's, rics and a few acans. So a reefer 170 might be a little big and my fusion 10 might be just a little small. Thanks @DaveFason! Your light is making it all possible. That's sad to hear @Lula_Mae. Hope everything will work out fine with your tank.